Ideal for the Engish rider and great for showing in. It's now a snap to dress up your studs! Are you an english style rider? If you are these are fantastic for the show ring. 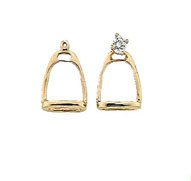 Please anyone today with these great english stirrup earrings. Pictured with diamond stud to show dimension. Diamonds not included in the purchase. If you require studs just email us with your request for pricing and availibility.